What did Napoleon Hill have to say about Mastermind Groups? 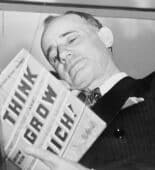 Napoleon Hill wrote and taught extensively for decades. Throughout his career, he advocated the use of mastermind groups as a way of taking your personal and professional life to the next level. Why does he call it a master mind alliance, compared to the more modern phrase, mastermind group? Hill originally said that when two people got together, a third mind, the Master Mind, was created. To him, it was a separate force in the conversation. Over the past 85 years, it’s morphed from “master mind alliance” to “mastermind group,” but the meaning and underlying principles are still the same. Most people think the first mention of mastermind groups was written by Hill in his Think and Grow Rich. But nearly 10 years earlier, he wrote The Law of Success, and talks about “the Master Mind” and how it’s a friendly alliance among people to support each other with their plans. In The Law of Success, Hill adds another element to the idea of a mastermind group: the group helps to organize useful knowledge, creating a virtual encyclopedia from which each member can draw information. That’s a strong message about what makes a mastermind group succeed or fail. To Hill mastermind groups are established to help create an environment that nurtures and supports growth. Notice how he uses the word “friendly” throughout his discussion of mastermind groups? Hill believed that a harmonious groups of two or more people who come together for a specific purpose, or around a specific topic, bring forth the power of creativity and support that you can’t find when you go it alone. “Now here are some interesting facts about the mastermind which give you an idea of how important it is and how necessary that you embrace this principle and make use of it in attaining success in your chosen occupation. First of all, it is the principle through which you may borrow and use the education, the experience, the influence, and perhaps the capital of other people in carrying out your own plans in life. It is the principle through which you can accomplish in one year more than you could accomplish without it in a lifetime if you depended entirely on your own efforts for success.” Wow, that’s powerful! When starting a mastermind group, or joining an existing one, look for these three hallmarks: friendly, growth-oriented, and willing to share information. I like to think that “friendly” really defines what a mastermind should be. I have attended one mastermind group before, and it seemed people do not really know each other much. It was not friendly. I did not attend again. I feel the role of the Mastermind Group Facilitator is to create that friendly atmosphere you’re referring to. When there is a strong sense of rapport and trust among the members, a mastermind group can be a very powerful thing. Thanks Karyn for sharing from you rich treasures. I have started a master mind group and its doing wonderfully well. Like you said the members need to be growth oriented, and willing to help one another succeed.